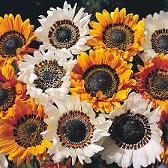 Annual or tender perennial native African herbaceous plants, members of the Daisy family, Compositae (Asteraceae), with woolly leaves and stems supporting single blooms. They make excellent potted plants and attractive border flowers. Arctotis is easily propagated by sowing seeds in a light mix of peat and sand. Sow seeds in pots or trays. Keep moist at 50-55F. Transplant seedlings to larger containers when they reach about 2 inches in height. Transplant outdoors when all danger of frost has passed. Space seedlings 15-20 inches apart each way. Seeds may also be sown in the fall for winter container planting. Seeds are sown in September for late winter flowering. These plants should be kept at a temperature no lower than 45F. 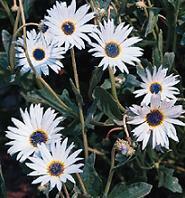 African Blue Eyed Daisy - Arctotis grandis (stoechadifolia) -Snowy white blooms atop strong stems make this an excellent cut flower type. Height: 20 inches Spread: 24"
Harlequin Mix - Arctotis x hybrida - Showy blend of colors on string stems with large 3-4 inch blooms. Great container plant.